Context: Medicinal plants have reportedly fewer side effects, compared to antifungal agents. Aims: This study was designed to compare the anti-Candida activity of two medicinal plants with two routine antifungal agents, used in the clinics, on Candida species isolated from the oral cavity of the liver transplant patients. Subjects and Methods: Anti-Candida activities of ethanol extracts of Lawsonia inermis leaf and Ziziphus spina christi unripe and ripe fruit (collected from south of Iran) versus nystatin and fluconazole were evaluated using CLSI M27-A3 standard method. Results: The minimum inhibitory concentration (MIC) 90 values for L. inermis, Ziziphus spina christi ripe, and unripe fruits in Candida albicans were 0.1 μg/mL, 25 μg/mL, and 0.1 μg/mL, and in Candida glabrata were 0.05 μg/mL, 25 μg/mL, and 0.05 μg/mL, respectively. The MIC90 value for nystatin in both species was 0.035 μg/mL, but MIC90 value for fluconazole in C. albicans was 0.5 μg/mL and in C. glabrata was 2 μg/mL. Conclusion: Unripe fruits of Ziziphus spina christi and L. inermis were found more effective than fluconazole on Candida species. Ziziphus spina christi unripe fruit and L. inermis leaf have potential anti-Candida activity and can be considered as a new mouthwash agent to prevent and treat Candida infections. Further studies regarding pharmacokinetics and toxicities of these extracts are needed for their use in humans. Herbal remedies are very popular in the world on the ground that they are providing a valuable source of new antimicrobial agents., It has been used for a long time in human history and 57% of the world population use medicinal herbs to treat their diseases. Medicinal plants were found to be more useful in comparison with synthetic drugs because of their safety, lower cost, and limited side effects. Treatment properties of herbal plants for AIDS, cancer, malaria, and chronic complaints have been reported., Furthermore, certain essential oil had an acceptable antifungal effect in root canals. Candida species are the pathogenic organism creating mucocutaneous and systemic disorders in humans, especially in immunocompromised patients such as transplant recipients and those with diabetes, xerostomia, malnutrition, malignancy, and poor oral hygiene., Oral candidiasis can cause pain, dysphagia, loss of taste, burning, and food sensitivity  and is the risk factor for systemic candidiasis in immunocompromised patients. Recent investigations revealed that invasive fungal infections occur in 36%–50% of the liver transplant recipients (LTRs), without antifungal prophylaxis with the mortality rate of 25%–90%.,Candida (C) albicans is the most prevalent fungus and Candida glabrata is the other common Candida species isolated from the oral cavity of infected patients. There are reports about the antifungal resistance in both C. albicans and C. glabrata species., There is a need for new anti-Candida compounds with less toxicity and greater efficacy. The aim of the present study was to compare the antifungal activity of Ziziphus (Z) spina Christi fruits (unripe and ripe) and Lawsonia (L) inermis leaf with two common antifungal drugs, nystatin and fluconazole, on C. albicans and C. glabrata species isolated from the oral cavity of LTRs. L. inermis leaves and Z. spina christi fruits (unripe and ripe) were collected from South of Iran and identified by Medicinal and Natural Products Chemistry Research Center, Shiraz University of Medical Sciences, Shiraz, Iran. The plant materials were dried at room temperature and ground into fine powders. The powders (300 grams) were macerated in 3 liters of ethanol (80%, v/v) at room temperature for 48 h. Extracts were filtered by filter funnels fitted with Whatman No 1 filter papers (Whatman, USA). The extracts were concentrated using an EYELA rotary evaporator (N-1000, Japan) set at 40°C–50°C and freeze-dried using the Edwards freeze dryer (Edwards High Vacuum International Crawley, Sussex, England). The study was undertaken on Candida species isolated from the LTRs enrolled in our previous study. Samples were provided from the palate, tongue, gums, and teeth by rubbing a sterile swab. The standard strain of C. glabrata ATCC2001 was used in parallel with the isolates. To evaluate the purity of 51 C. albicans and eight C. glabrata isolated from the patients, all species were cultured (twice) on potato dextrose agar (Oxoid Ltd; Basingstoke, Hampshire, England). The antifungal activity of fluconazole, nystatin, L. inermis leaves, and Z. spina chiristi fruit (ripe and unripe) extracts on C. albicans and C. glabrata (the most isolated yeasts) were evaluated based on the CLSI M27-A3 standard method in triplicate. Dilution equal to 0.5 McFarland was prepared for each Candida species. Dilution equal to 1 mg/ml was prepared for each extract and filtered with 0/2 μm filter paper (Sartorius, Germany). One hundred microliter RPMI 1640 broth (Sigma Chemical Co, Germany) buffered to PH 7.0 with MOPS buffer (Sigma, Germany) was poured into each well of 96-well plates. In the first column of wells, 100 μL of each extract added and mixed with RPMI, and serial dilution was prepared. Then, 100 μL of the 0.5 McFarland of standard and isolated Candida suspensions were added to each well except for negative controls. Totally, the concentrations between 25–0.05 μL, 64–0.125 μL, and 18–0.035 μL were used for each extract, fluconazole, and nystatin, respectively. In each series, 11th and 12th wells were considered as positive and negative wells, without extracts or antifungals and yeast suspension, respectively. The plates were incubated at 35°C for 24 h. The minimum inhibitory concentration (MIC) was defined as the lowest concentration of extract or antifungal with the 50% growth decreased, compared with the positive controls. The results are reported as the mean values recorded in three different experiments. To evaluate the MFC, 50 μl of each clear (without visual growth) homogenized well suspension was cultured onto the plates containing Sabouraud Dextrose Agar (Merck, Germany) in triplicate and incubated at 35°C for 48 h. The MFC was considered as the lowest concentration of drug that caused 99.9% inhibition of growth compared with positive control. In these investigations, each separated colony was equivalent to a viable cell (colony forming unit [CFU]). The mean viable Candida colony counts (CFU/mL) in three plates in different concentrations were compared with the mean viable fungal counts in the positive control (well without extract). This study was carried out in accordance with the Declaration of Helsinki and approved by the ethics committee of Shiraz University of Medical Sciences, Shiraz, Iran. The results were analyzed using SPSS version 16 (Chicago, IL, USA) and the Mann–Whitney U-test. P < 0.05 was considered statistically significant. The MIC50 and MIC90 value, mean, and standard deviation of each extract and antifungal agent (fluconazole and nystatin) on C. albicans and C. glabrata species were shown in [Table 1] and [Table 2]. Using Mann–Whitney test, we compared mean MIC values of the extracts and antifungal agents. The antifungal activity of unripe and ripe fruit extracts of Z. spina christi present a significant activity against the two Candida species (P< 0.001 for C. albicans and P < 0.04 for C. glabrata) and unripe fruits were more active than ripe ones. L. inermis leaf was similar to the unripe fruit of Z. spina christi in activity against Candida species (P = 0.375 for C. albicans and P = 1 for C. glabrata). Comparison between nystatin and extracts revealed that nystatin was the most active agent against all species. As for extracts and fluconazole, unripe fruits of Z. spina Christi and L. inermis leaves proved more active than fluconazole (P< 0.001) in C. glabrata. Fluconazole was more active than ripe Z. spina Christi fruits with significant difference (P< 0.001 for C. albicans and P < 0.043 for C. glabrata). None of the extracts presented fungicidal activity on both Candida species. L. inermis or henna is an herb used in coloring hair, skin, and nails. Antibacterial and antifungal activities were reported for this plant in the literature.,Z. spina-christi, known as Christ's thorn Jujube or sidr, is an evergreen tree which grows in the warm-temperate climate including Africa, South Europe, Mediterranean, Australia, tropical America, South and East of Asia and Middle East., They are very popular in Iranian traditional medicine. C. albicans is the most frequent Candida species isolated from oral candidiasis and it was reportedly isolated from 53% of LTRs oral cavities as colonization in Nazhvani et al. This organism can act as a source of invasive and systemic Candida infection with a high mortality rate in the recipients.C. glabrata is a common fungal pathogen in the oral cavity, causing systemic and mucosal infections, and exhibiting natural resistance to azole antifungal agents. Our results showed similar anti-Candida growth inhibition effects of L. inermis leaf and unripe Z. spina Christi in comparison with fluconazole in C. albicans. These plants exhibited more growth inhibition effect in C. glabrata than fluconazole. 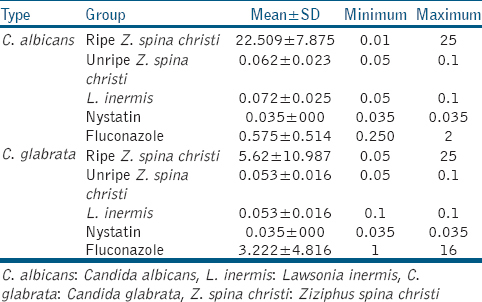 In our study, MIC90 values for L. inermis and unripe Z. spina Christi in both Candida species were 0.1 μg/ml, but MIC90 values for fluconazole against C. albicans and C. glabrata were 0.5 μg/ml and 2 μg/ml, respectively. The antifungal activity of alcoholic extracts of L. inermis against C. albicans in Soliman et al. was reported 10 ± 1.3 μg/mL. For mold fungi, the MIC values of L. Inermis in Fusarium oxysporum and Aspergillus flavus were reported 12 μg/mL and 50 μg/mL, respectively. In another study, antimicrobial activity of L. inermis, ethanol leaf extracts against C. albicans, was reported to be similar to that of nystatin; however, petroleum ether extract was more active than it. The difference between the studies may be due to the type of the extract (petroleum ether, ethanolic, methanolic, and aqueous), the region the plants grow, and the fungal population studied (different species of yeasts or molds). A recent study reported antioxidant, hypoglycemic, anti-inflammatory, and hypotensive properties for Z. spina-christi fruit. The antimicrobial effect of Z. spina Christi fruit, according to biological and chemical assays, was reported to be due to flavonoid subfractions (rutin, quercetin, myricetin, apigenin, quercetin-3-O-galactoside, luteolin, kaempferol and kaemferol-3-O-robinoside, apigenin-7-O-lucoside, quercitrin, quercetin, isovitexin, rutin and quercetin-3-O lucoside-7-O-arabinose rhamnoside). In Ads et al., ethyl acetate and alkaline ethyl acetate of ethanolic extract fractions of Z. spina-christi stem bark did not present any anti-C. albicans activity. In previous studies, the antifungal activity of unripe and ripe fruits separately was not investigated. We evaluated unripe and ripe fruit antifungal activities and observed a high anti-Candida activity for the unripe fruit. There are a few studies which reported the MFC of these plants. In the present study, none of the plants exhibited fungicidal activity. The MFC of Z. spina-christi in C. albicans was reported >1 μg/ml. It seems that such plants have not fungicidal activity in low extract concentrations. Given the resistance to antifungal agents and respective side effects, we need to find new agents as drug or mouthwash to prevent oral candidiasis. Developing a mouthwash with Z. spina-christi unripe fruit and L. inermis leaf extract for the treatment of Candida colonization and oral candidiasis in immunocompromised patients is suggested. Further studies in regard to pharmacokinetics and toxicities of these extracts are needed for their use in humans. Vice-Chancellor of Research at Shiraz University of Medical Sciences supported this research (Grant No 94-01-03-9553). Cecília de Fátima CB, de Amorim EL, de Albuquerque UP, Maia MB. Medicinal plants popularly used in the Xingó region – A semi-arid location in Northeastern Brazil. J Ethnobiol Ethnomed 2006;2:15. Kayser O, Kiderlen AF.In vitro leishmanicidal activity of naturally occurring chalcones. Phytother Res 2001;15:148-52. Abramov V. Traditional medicine. World Health Org 1996;134:1-3. Babu PD, Subhasree RS. Antimicrobial activities of Lawsonia inermis – A review. Acad J Plant Sci 2009;2:231-2. Lee KH. Anticancer drug design based on plant-derived natural products. J Biomed Sci 1999;6:236-50. Lee KH, Morris NS. Anti-AIDS agents 35 recent advances in the discovery and development of plant-derived natural products and their analogous as anti-HIV agents. Pure Appl Chem 1999;19:90-105. Sedigh-Shams M, Badiee P, Adl A, Sarab MD, Abbaszadegan A, Nabavizadeh M, et al. In vitro comparison of antimicrobial effect of sodium hypochlorite solution and Zataria multiflora essential oil as irrigants in root canals contaminated with Candida albicans. J Conserv Dent 2016;19:101-5. Badiee P, Alborzi A, Vojdani R, Shakiba E, Rasouli M, Ravanfar P, et al. Early diagnosis of systemic candidiasis in bone marrow transplant recipients. Exp Clin Transplant 2010;8:98-103. Coronado-Castellote L, Jiménez-Soriano Y. Clinical and microbiological diagnosis of oral candidiasis. J Clin Exp Dent 2013;5:e279. Dangi YS, Soni ML, Namdeo KP. Oral candidiasis: A review. Int J Pharm Pharm Sci 2010;2:36-41. Badiee P, Kordbacheh P, Alborzi A, Malekhoseini S, Zeini F, Mirhendi H, et al. Prospective screening in liver transplant recipients by panfungal PCR-ELISA for early diagnosis of invasive fungal infections. Liver Transpl 2007;13:1011-6. Winston DJ, Limaye AP, Pelletier S, Safdar N, Morris MI, Meneses K, et al. Randomized, double-blind trial of anidulafungin versus fluconazole for prophylaxis of invasive fungal infections in high-risk liver transplant recipients. Am J Transplant 2014;14:2758-64. Badiee P, Alborzi A, Shakiba E, Farshad S, Japoni A. Susceptibility of Candida species isolated from immunocompromised patients to antifungal agents/sensibilite aux antifongiques des especes de Candida isolees chez des patients immunodeprimes. East Mediterr Health J 2011;17:425. Parisa B, Alborzi A, Shakiba E, Ziyaeyan M, Rasuli M. Molecular identification and in-vitro susceptibility of Candida albicans and C. dubliniensis isolated from immu-nocompromised patients. Iran Red Crescent Med J 2009;2009:391-7. Nazhvani AD, Haddadi P, Badiee P, Malekhoseini SA, Jafarian H. Antifungal effects of common mouthwashes on Candida strains colonized in the oral cavities of liver transplant recipients in South Iran in 2014. Hepat Mon 2016;16(1):e31245. Clinical and Laboratory Standards Institute. Reference Method for Broth Dilution Antifungal Susceptibility Testing of Yeasts; Approved Standard. CLSI Document M27-A3 and Supplement S3, Wayne, PA 19087 USA: Clinical and Laboratory Standards Institute; 2008. Jothiprakasam VI, Ramesh SA, Rajasekharan SK. Preliminary phytochemical screening and antibacterial activity of Lawsonia inermis Linn (Henna) leaf extracts against reference bacterial strains and clinically important AMPC beta-lactamases producing Proteus mirabilis. Int J Pharm Pharm Sci 2013;5:219-22. Rahmoun N, Boucherit-Otmani Z, Boucherit K, Benabdallah M, Choukchou-Braham N. Antifungal activity of the algerian Lawsonia inermis (henna). Pharm Biol 2013;51:131-5. Orwa C, Mutua A, Kindt R, Jamnadass R, Anthony, S. Agroforestree Database: A tree reference and selection guide version 4.0. World Agroforestry Centre, Kenya. 2009. Salehi MH. Medicinal Plants and Phytotherapy. Vol. 3. Tehran: Donya e Taghzieh Publications; 2010. p. 292. Lins L, Bastos J. Oral health protocol for liver transplantpatients. Transplantat Technol 2014;2:2. Soliman SS, Semreen MH, El-Keblawy AA, Abdullah A, Uppuluri P, Ibrahim AS, et al. Assessment of herbal drugs for promising anti-Candida activity. BMC Complement Altern Med 2017;17:257. Shahat AA, Pieters L, Apers S, Nazeif NM, Abdel-Azim NS, Berghe DV, et al. Chemical and biological investigations on Zizyphus spina-christi L. Phytother Res 2001;15:593-7. Suleiman EA, Mohamed EA.In vitro activity of Lawsonia inermis (Henna) on some pathogenic fungi. J Mycol 2014;2014:Article ID 375932. Guizani N, Waly MI, Singh V, Rahman MS. Nabag (Zizyphus spina-christi) extract prevents aberrant crypt foci development in colons of azoxymethane-treated rats by abrogating oxidative stress and inducing apoptosis. Asian Pac J Cancer Prev 2013;14:5031-5. Ads EN, Rajendrasozhan S, Hassan SI, Sharawy SM, Ragheb Humaidi J. Phytochemical, antimicrobial and cytotoxic evaluation of Ziziphus spinachristi (L.) stem bark. Biomed Res 2017;28:6646-53.